The Hitachi CP-WX8265 was instrumental in adding “strikingly modern twists” to TPAC’s rendition of the classic Christmas play which featured an 18-member cast, a full orchestra, and fog effects. 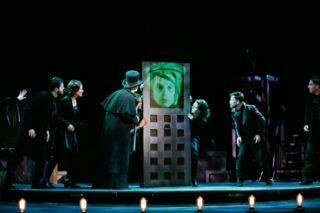 NASHVILLE, TN—Hitachi’s CP-WX8265 projector was instrumental in Studio Tenn’s critically acclaimed debut of Charles Dickens’s classic "A Christmas Carol" at the Tennessee Performing Arts Center’s Polk Theater. Located in Nashville, the James K. Polk Theater is an intimate proscenium theater for its size, with a maximum seating capacity of 1,075. The distance from the projection booth to the back wall of the set is 102 feet and the projection area is approximately 56 x 20 feet. The Hitachi CP-WX8265 was instrumental in adding “strikingly modern twists” to TPAC’s rendition of the classic Christmas play which featured an 18-member cast, a full orchestra, and fog effects. Traditionally performed in the more intimate Franklin Theater, this was the first year that TPAC used the Polk Theater for "A Christmas Carol". The Studio Tenn Theatre company was established in 2009 in order to combine talent from Nashville and Broadway, bringing classic works of drama and musical theatre to life in Middle Tennessee. The Hitachi CP-WX8265 3LCD projector features 6,500 ANSI lumens brightness, motorized lens shift, Perfect Fit (which allows easy shaping of the projection to fit to the projecting area) and setup memory, which allows for quickly changing lens and focus settings for specific scenes.